Having had his turn at handling the troubled Jammu & Kashmir as chief minister, an articulate and passionate Omar Abdullah spoke to me in an exclusive interview about how Mufti cannot be a reluctant head of government, behave like a child and set fire to the Valley, and run away from crisis. Abdullah also spoke about the role of some news channels fanning TRPs by stoking passions, the use of pellet guns by security forces - which is blinding hundreds of Kashmiris - and the growing Islamisation in the Valley. Kashmir is on fire again. Why? Post the Burhan Wani encounter, should the Valley have been allowed to burn like this? First and foremost, the state government seems completely confused as to who is in charge. There seems to be a concerted attempt to built a cocoon of deniability around Mehbooba Mufti. The state government, on the other hand, is unsure who has the reins. It leads one to draw the conclusion that she is not in charge of her own state. We were told by a senior police officer that Mehbooba knew about the Burhan cordon and the succeeding encounter. The story changed in a few hours. Judging from experience, I refuse to believe that the CM was not kept informed. I simply do not buy it. If Mehbooba indeed did not know, it's even worse. The CM has no business not knowing because this has wider implications. 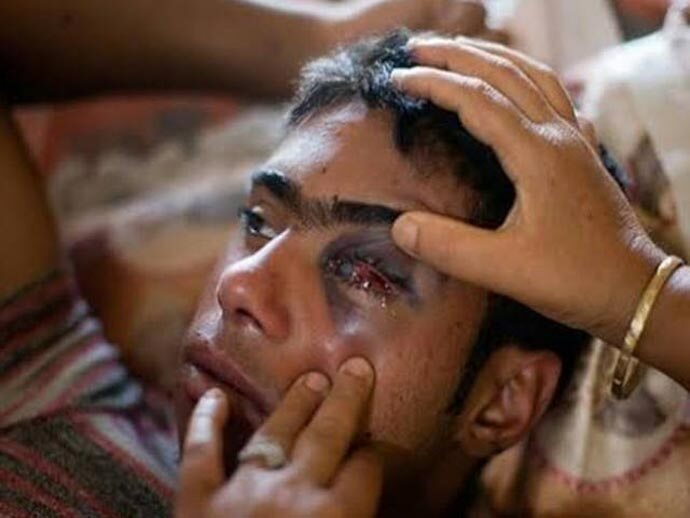 Nearly 100 Kashmiris have lost their vision in the pellet firing. PDP and BJP say you introduced them in 2010. That's bizarre logic! I want to ask the state, who is using the pellet gun now? Please don't use them; you are the CM, not Omar Abdullah. I handled a far more sensitive situation in the aftermath of the execution of Afzal Guru without using them and blinding people; we did not watch thousands of people being put in hospitals and the whole state go up in flames. Standard Operating Procedure(SOP) and protocols had been put in place, which the government is not following. Pellet guns were never to be deployed in this manner. As CM, you faced the critical 2010 stone pelting unrest. Did you then use excessive force to end the protests as Mehbooba is doing now? We need to get a handle on the use of force. I am not lobbying against the government or seeking to replace Mehbooba Mufti. This is in contrast to what she and her father did when they told Kashmiris that get rid of Omar Abdullah and 80 percent of your problems will end. The daily dose of violence has to end. She will learn her own lessons which is unfortunate because she could have learnt a lot from what went wrong for me. Shah Faesal's post "The studios are competing with the street" explained he was facing a mob because of the role of certain channels in the portrayal of the post-encounter violence. What do you think? All Kashmiris share a revulsion for the current level of suffering. The portrayal and projection of Kashmir is not new. Whether we like it or not, the news channels are a business and they fan nationalistic passions. They are not helping the situation, but making things worse for Kashmir. They have very little understanding of the nuances of the situation in the Valley. They have a pulpit and they put it to good use to drum up TRPs. Is the clampdown on the local media and printing of newspapers unprecedented? The Centre has not done it. We know that the Mufti government ordered the clampdown and there is an effort to fudge the facts. It took you 72 hours to react. The editors are not fools and they did not stop the press on their own. PDP is now trying to drown the chorus because Parliament is in session. It has made the situation worse as rumours are the only information. In the absence of credible news, this fans passions even further. Only BSNL postpaid connections are active in the Valley; there is no other internet or cell phone access. Why doesn't Mehbooba admit that she ordered it? The state government never put it in writing, but they directed the police to stop the press. Mehbooba seems to have cordoned herself off. Do you think she wants to break her party's unpopular alliance with the BJP? I am sure that thought has crossed her mind, but she cannot set the state on fire and run away. The CM can't leave it to somebody else to clean the mess. They did it earlier with Ghulam Nabi Azad on the Amarnath land row in 2008. They can't make a habit of setting J&K on fire. I am sorry you are sitting on the CM chair, nobody has tied you to the chair. Now you give the impression that you are a reluctant CM. You are not serving your father's memory by setting the state on fire. You are no little girl. You are obliged to put the state on tracks. You have enjoyed the trappings of office and chose to become CM when things were peaceful. We will not allow you to escape your responsibility. I can only take the Union home minister at his word. He said in Parliament that he was ready to help defuse the situation, but was told by Mehbooba not to come. I can't hold the Centre responsible if the CM tells him not to come to Kashmir's aid. If she and her associates are saying she is not taking the decisions, who is? Are the PDP and the NC doing nothing about the growing Islamisation in the Valley? This is a convenient stick to beat both of us with and I have raised it with the Centre. Why don't they act? I have asked where the money is coming from. You have all the resources and the intelligence as the government of India. Currently, it's only mishandling. What are the political solutions for Jammu and Kashmir's future? Militancy did not start because of the lack of economic opportunity. Packages are not the answer. You cannot buy peace; you need to arrive at a political solution. Rs 80,000-crore packages post floods don't work. You only look at Kashmir when it's burning. Kashmiris are not ungrateful. I had once said this in the presence of former PM, Dr Manmohan Singh, but solutions cannot be bought. Successive governments only wake up when there is trouble - don't incentivise it. What does Omar Abdullah feel about the mess in the Valley as a Kashmiri? I feel deeply disappointed. This really was an opportunity that seems to have been frittered away. It could have been managed better, but what does one do when you have a reluctant CM?